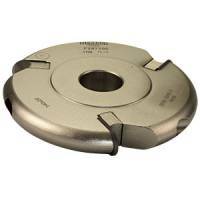 Good quality collets of the correct size are essential to ensure the performance and life of cutters. Worn or incorrectly sized collets will result in poor performance and often lead to broken cutters. Collets should be cleaned and checked regularly and renewed periodically. Collet shank sizes: the ER collet series was designed to be compressible. Often marked with two sizes, the larger dimension is the machined bore size of the collet. Cutter life and cutting performance are reduced when the collet size does not exactly match the cutter shank. Therefore if a collet is marked, for example 6-5, it should only be used for cutters of 6mm shank and not any smaller. Use the table below to indentify your collet from the dimensions given.